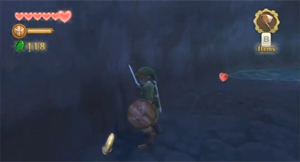 When you defeat enemies, they will normally drop hearts or rupees. Sometimes, they will drop items called 'Treasure'. These items can be collected and used to upgrade various weaponry and items, such as swords, shields, and equipment obtained during the game. This can be done in at Gondo's Scrap Shop in the Bazaar as long as you have enough of the Treasure required. Not all enemies drop treasure though, which is naturally what this guide will cover. Some treasure can only be found on the ground in a specific region or time as well. The odds of finding treasure will increase if you have the Treasure Medal in possession. In addition to upgrading your gear, treasure can also be sold. You can enter Rupin the Item Shop Owner's house at night, and he will buy treasure from you for a cheap price. Below, you will find a guide detailing three specific things: the location of treasure or the enemy from which it can be obtained; the Sale Price Rupin will give you if you sell treasure to him; and the Upgrades the treasure can be used in. Along with this, you will also find a screenshot showing the item; a image of the treasure from the game; and a short description of the treasure. For full context as to where each upgrade can be acquired, be sure to take a look at our Skyward Sword Walkthrough. 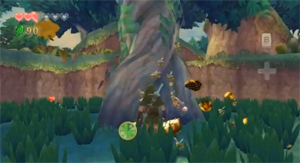 The Amber Relic is by far the most common treasure in Skyward Sword as it is found in all areas of the game; although most commonly in the Faron Woods region. They can often be found under logs, hidden in grassy areas, or simply out in the open area. 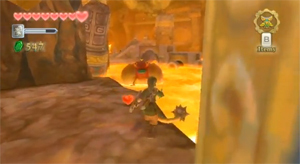 Read More about Amber Relic at the Zelda Dungeon Wiki. Ancient Flowers can only be found in the Lanayru Region, and specifically, only in the past regions affected by Timeshift Stones. They are usually found in open areas, on higher levels of ground not normally traveled across. 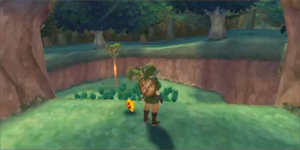 Read More about Ancient Flower at the Zelda Dungeon Wiki. Bird Feathers are one of the few treasures that cannot be found normally on the ground or from enemies. To get one, you must travel to the Faron Region. Here, you can look for a group of birds, then sneak up on one, and use the Bug Net to catch it. Read More about Bird Feather at the Zelda Dungeon Wiki. Blue Bird Feathers are much like the regular Bird Feathers, and cannot be found normally on the ground or from enemies. To get one, you must travel to the Faron Region. Here, you have the chance of finding a rare blue bird. You can then use the Bug Net to catch it and receive a Blue Bird Feather. This Feather can also be purchased from the Moonlight Merchant Gossip Stone for 200 rupees. This Gossip Stone can be found in the Waterfall Cave on Skyloft only after completing the Skyloft Silent Realm. Walk through the cave until you reach the middle of it, and you'll see a group of Blessed Butterflies surrounding the area. Use the Harp to summon the Gossip Stone. 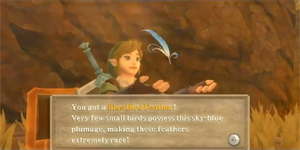 Read More about Blue Bird Feather at the Zelda Dungeon Wiki. Dusk Relics can be found almost entirely only in the Silent Realm, with a few exceptions. They are look almost completely like Amber Relics, except they are purple in color. Dusk Relics can also be purchased from the Moonlight Merchant Gossip Stone for 100 rupees. This Gossip Stone can be found in the Waterfall Cave on Skyloft only after completing the Skyloft Silent Realm. Walk through the cave until you reach the middle of it, and you'll see a group of Blessed Butterflies surrounding the area. Use the Harp to summon the Gossip Stone. Read More about Dusk Relic at the Zelda Dungeon Wiki. Eldin Ore can be found in the Eldin Region, specifically, in the Eldin Volcano and Earth Temple. They are often found using the Digging Mitts, but can also commonly be found in treasure chests. Read More about Eldin Ore at the Zelda Dungeon Wiki. 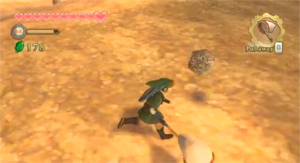 Evil Crystals are one of the rarest treasures in Skyward Sword. They can be found rarely from Cursed Bokoblins, or from treasure chests in the Lanayru Region. These Crystals can also be won on Bamboo Island after slashing a certain number of times. They can also be purchased from the Moonlight Merchant Gossip Stone for 100 rupees. This Gossip Stone can be found in the Waterfall Cave on Skyloft only after completing the Skyloft Silent Realm. Walk through the cave until you reach the middle of it, and you'll see a group of Blessed Butterflies surrounding the area. Use the Harp to summon the Gossip Stone. 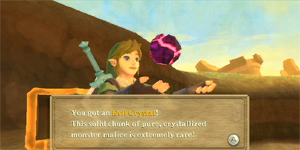 Read More about Evil Crystal at the Zelda Dungeon Wiki. Goddess Plumes are among the most rare treasures in Skyward Sword. One can be found behind a bombable wall in the Faron Woods where the Kikwi Erla hid. 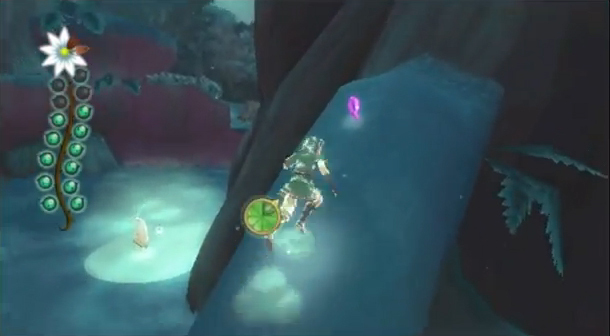 A second can be found in the pool of water containing the entrance to the Great Tree, and can be obtained after obtaining the Water Dragon Scale. Another can be found in a chest on top of a pillar in Lanayru Mine, immediately after the part where you must roll a bomb across an impassable length of sand to trigger a time crystal. A third can be found in a chest in the southern region of Lanayru Desert near where you first enter the desert. Hit the Timeshift Stone to follow some vines to it. Goddess Plumes can also be won from Bamboo Island after slicing 28 or more times in a row, and from the Thrill Digger after finding all rupees on Easy Mode. They can also be purchased from the Moonlight Merchant Gossip Stone for 100 rupees. This Gossip Stone can be found in the Waterfall Cave on Skyloft only after completing the Skyloft Silent Realm. Walk through the cave until you reach the middle of it, and you'll see a group of Blessed Butterflies surrounding the area. Use the Harp to summon the Gossip Stone. 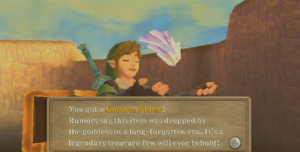 Read More about Goddess Plume at the Zelda Dungeon Wiki. Golden Skulls are a scarce treasure, normally dropped from Bokoblins when defeated. They can also be won at Bamboo Island after slicing 28 times, and can be purchased from the Moonlight Merchant Gossip Stone for 200 rupees. This Gossip Stone can be found in the Waterfall Cave on Skyloft only after completing the Skyloft Silent Realm. Walk through the cave until you reach the middle of it, and you'll see a group of Blessed Butterflies surrounding the area. Use the Harp to summon the Gossip Stone. Read More about Golden Skull at the Zelda Dungeon Wiki. Hornet Larvae is a tricky treasure to find. It can only be found hanging on trees in the Deep Woods, and is surrounded by Hornets that make it their nest. You must shoot the nest down with a Slingshot, the Bow, or by rolling into it, which is by far the most dangerous way. Shoot at it from a distance; if you are close, the Hornets will start to attack you. After the nest falls to the ground, the Hornet Larvae will pop out and fall to the ground. Read More about Hornet Larvae at the Zelda Dungeon Wiki. Jelly Blobs are a common treasure, received from Chuchu, Deku Baba, and Aracha when defeated. 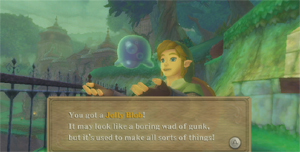 Read More about Jelly Blob at the Zelda Dungeon Wiki. Lizard Tails are, litterally, the Tails of Lizalfos. Therefore, they can only be found from Lizalfos, located in the various regions of Skyward Sword. They are relatively common, and only received after defeating Lizalfos. Read More about Lizard Tail at the Zelda Dungeon Wiki. Monster Claws can be found after defeating Keese. They are relatively common, as are Keese, and are used in a considerable number of upgrades. Read More about Monster Claw at the Zelda Dungeon Wiki. Monster Horns can be found after defeating Bokoblins Leaders. They can also be purchased from the Moonlight Merchant Gossip Stone for 100 rupees. This Gossip Stone can be found in the Waterfall Cave on Skyloft only after completing the Skyloft Silent Realm. Walk through the cave until you reach the middle of it, and you'll see a group of Blessed Butterflies surrounding the area. Use the Harp to summon the Gossip Stone. Read More about Monster Horn at the Zelda Dungeon Wiki. Ornamental Skulls are randomly dropped from all types of Bokoblin. They are very common treasure. Read More about Ornamental Skull at the Zelda Dungeon Wiki. Tumbleweed rolls across the present areas of the Lanayru Desert. They move fairly quickly, and will disappear if they roll across quicksand. 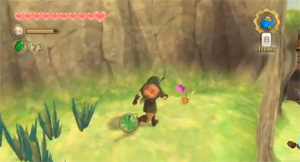 Read More about Tumbleweed at the Zelda Dungeon Wiki.